Skull Rend deals 2 damage to each opponent. Those players each discard two cards at random. 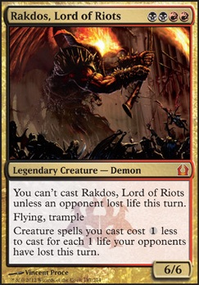 Crosis's Charm , Cruel Ultimatum , Jin-Gitaxias, Core Augur , Dream Salvage , Perplex , Skull Rend , Fraying Omnipotence , Rakdos's Return , Wit's End , Quest for the Nihil Stone , Patient Rebuilding , Shrieking Affliction , Torment of Hailfire , And also there's lots of great specter creatures that would work great in the deck, probably better than a dragon sub-theme if you wanted to go full discard control. you only have one creature boardwipe, ( Hour of Devastation ), so I would take out Earthquake and add in cards like Last One Standing , Fire Covenant , Damnation , Blasphemous Act , or Decree of Pain . Since pirates are fairly weak as a tribe, you're going to need to limit what others can do and attack their resources in order to chip in for the win. Your commander helps with creatures, so I would attack the hand and mana to slow them down. I recommend discard like Capital Punishment , Dark Intimations , Discovery / Dispersal , Herald of Anguish (great with treasures! 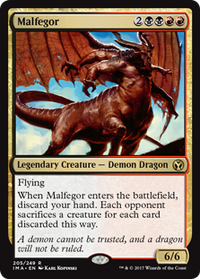 ), Syphon Mind , Liliana's Specter , Nicol Bolas, the Ravager Flip, Scythe Specter , Siren of the Silent Song , Skull Rend , Tasigur's Cruelty , and Torment of Hailfire . While land destruction is often looked down upon as unfun, if you decide to keep with a lot of small creatures, you can come out at an advantage by keeping the lands on the board low. You'd have to build your deck to accommodate that, though. For that, you have Mana Vortex , Tectonic Break , Desolation , Epicenter , Ember Swallower , Rite of Ruin (again, great with treasures), Boom / Bust , Impending Disaster , and Wake of Destruction . You'll also find that creature stealing effects snowball, since you can remove blockers to get in with your pirates. Insurrection , Expropriate , and Blatant Thievery will all serve you well. I would also lean more heavily into treasures. Mechanized Production acts as a second copy of Revel in Riches to that end, and Brass's Bounty will help get you there. Some generic tribal cards will also help. Cards like Vanquisher's Banner , Shared Animosity , Door of Destinies , Konda's Banner , Kindred Dominance , Kindred Discovery , Coat of Arms , Metallic Mimic , Adaptive Automaton , Obelisk of Urd , Path of Ancestry , etc. will help shore up the weakness of the tribe. As for old pirates, consider Rishadan Brigand , Rishadan Cutpurse , Rishadan Footpad , Talas Explorer , Talas Warrior , and Cloud Pirates . 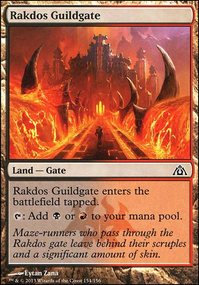 Finally, I would head to EDHREC just to see the staples that are played in Grixis colors, as well as for your commander and whatever theme you choose to go with. You can also toggle to budget in the top right in order to see what will make it easier to build without sinking a bunch of money into the deck. However, keep in mind that cards like River's Rebuke don't scale up well to multiplayer, so you'll find the choices people make are very different. While cards like Cyclonic Rift , Sol Ring and Vandalblast will hurt the pocketbook a bit, they're good investments for whatever Commander decks you choose to build in the future. If you don't like what you see, you can also head to Scryfall to search for cards. They'll let you limit the results to cards in your color identity, put price limits, and let your rank the results by how much commander play they see. On topic...discard in multiplayer can be done, but beware of a couple things. People get annoyed when their resources are whittled away, so prepare to get hit a lot. I have a multiplayer discard deck that uses Recurring Nightmare to bring back stuff like Liliana's Specter, Thoughtrender Lamia and Rotting Rats. I’ve learned that you have to have a plan for the stuff that sticks, and you have to plan for the deck that can out draw your discard plan. Otherwise, like other posters have said, 1:1 discard is pure card disadvantage, so stuff like Skull Rend are pretty threatening. I once had an opponent Force of Will my Skull Rend because of the potential damage it could cause. I don't do competitive EDH, but discard-combo seems to work around the tables I play at; my personal favorite is Nath of the Gilt-Leaf with Sadistic Hypnotist or Mind Slash. Skull Rend is the multiplayer Blightning, and Waste Not should be a key piece. Just make sure your friend has a way to close out the game, unless he wants to be Enemy No. 1 in the next game. I love the concept, and this looks nicely balanced. And in Casual, my favorite format. 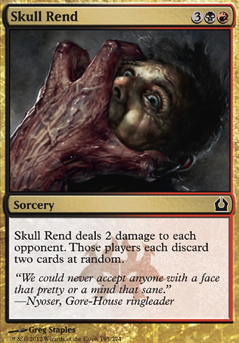 I like the look of Skull Rend for a R/B deck. It's a little above your mana curve but might work in the sideboard for some matchups. First of all, I would discard :) the whole Nekusar-wheel-theme. 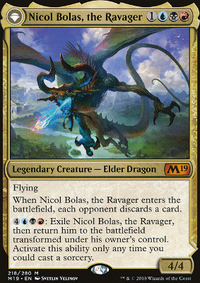 Nekusar, the Mindrazer decks just do it better anyways and playing Wheel of Fortune, Reforge the Soul, Jace's Archivist or Windfall in your deck has some drawbacks. While they're great to enable your plan of using the opponents' graveyards, your decks' cmc is not low enough to exploit those cards. Additionally, your opponents would get a significant amount of cards out of it, too, which also undermines the whole handcontrol theme of your deck: What's the matter of making them discard through Nicol Bolas, the Ravager Flip, when you're helping them to refill their hands the next turn? 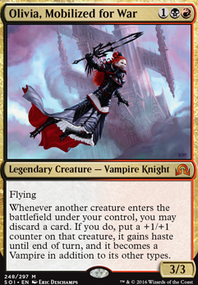 Cards like Megrim, Liliana's Caress or Fell Specter would have to go as well because they're only effective with the aforementioned cards. So my proposal is to focus on discard and control. Cards like Painful Quandary, The Eldest Reborn, Waste Not, Oppression and Chains of Mephistopheles fit well and should stay. You could add Skull Rend or Liliana's Specter. 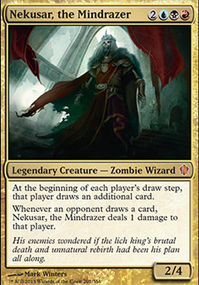 You could also add cards that let your commander re-enter the battlefield like Ghostly Flicker. Some ninjas like Silent-Blade Oni or Ink-Eyes, Servant of Oni do not only fit your theme but let you cast your commander again. To get more information about your opponents' hands you could play Telepathy or Glasses of Urza. I usually go with Glasses of Urza alongside Trinket Mage. You have to strengthen your control over the graveyards when you're making people discard. The Scarab God is already good here. But you need some more graveyard-hate like Relic of Progenitus or Phyrexian Furnace which give you a bit of a choice what to exile. Don't play Leyline of the Void in here. I'd also add Solemn Simulacrum like multimedia proposed. So far I mentioned 8 cards which should be cut, so here are 22 more: Kess, Dissident Mage, Nightveil Specter, Mind's Dilation, Omniscience, Torment of Hailfire, Disrupt Decorum, Entreat the Dead, Anvil of Bogardan, Go for the Throat, Blasphemous Act, Stunning Reversal, Thrilling Encore, Leyline of Anticipation (most of the permanents don't have to be played at instant speed. Casting leyline is just doing nothing for the turn), Bloodchief Ascension, Countersquall, Desertion, Preordain, Thoughtseize, Library of Leng, Disciple of Bolas, Hour of Devastation, Tormenting Voice. That's all for now. Good luck with your deck! Blightning in place of Skull Rend maybe? Or both?